Come learn about skin grafts, from ancient history to modern controversy, with London-based Paul Craddock, Monday May 9th! Hope to see you there. Late in 2010, The Economist ran a series of advertisements about transplant surgery on the London Underground, putting pressing questions to subterranean commuters like Paul Craddock. Ethics, black markets, identity, and the gap between organ supply and demand were all covered, and both sides of the arguments given, urging us to take a view on weighty questions while waiting for a train. The adverts presented The Economist as being at the cutting edge of debate in light of recent advances in transplant technologies, face transplants, and so forth but these questions are nothing new. No. Transplants did not even appear in the 1960s with the first heart transplant, or at any point in the twentieth century – or even the nineteenth. They were first widely addressed in the media and Literature of the eighteenth century but medical transplantation is actually an ancient skill. Skin grafts go back around 5,000 years, and were simple but bloody affairs. 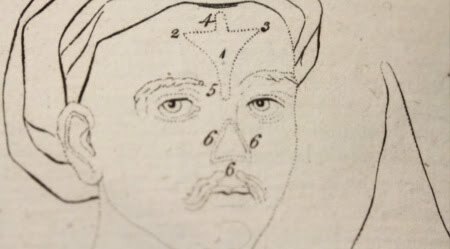 This illustrated lecture is about the ‘re-discovery’ of skin grafting from India in the early nineteenth century and the questions that seemed to raise. In what ways is it important that we can move skin? How did we find out that it was possible? What does it tell us about ourselves? If it is possible to have skin that’s not our own, what does this do to our sense of self? And what about identity? Why is this important to you, now? By thinking about how these questions were presented in the past, we may view and wear our own skins differently. Paul Craddock is a second-year Ph.D. candidate with the London Consortium holding the Science Museum's Science and Humanities Scholarship. He is working on The Poetics of Bodily Transplantation, 1702 - 1902, a cultural history of the transplant procedure in medicine covering the two hundred years prior to the recognized 'beginning' of organ transplant history. In a past life, he was a performance and sonic arts scholar, researching and teaching a phenomenology of sound and the experience of it as part of an environment. Currently based in London, Paul is also the Director of London Consortium TV, the London Consortium's televisual arm, and the Publicity and Guests' Secretary for the University of London's Extra Mural Literary Association. He recently found joy in producing and presenting films, of which he has made two and a third to date. For more, click here. You can sign up for the Observatory mailing list by clicking here, or join us our Facebook group by clicking here. For more about Observatory, click here. To contact organizers with questions or suggestions, click here. Exciting news! Good friend and brilliant puppeteer/manifester of alternate worlds Jonny Clockworks is opening a new incarnation of his infamous ClockWorks Theatre! Judging from Clockworks' fantastic former productions, this new venture is sure to become the center for innovative and beautiful puppet works in the New York area. The theater celebrate its opening this Saturday, April 30th, with an exciting evening's programming; full details follow. Very much hope to see you there! The new ClockWorks Theatre is located on Columbia Street in the Carroll Gardens neighborhood of Brooklyn, New York. More on the theatre here; more on the opening event here. Morbid Anatomy Libary Open Saturdays and Sundays, 12-6, Through May 15th! Greetings, all. For the next 3 weekends, The Morbid Anatomy Library will be open from 12-6 on Saturdays and Sundays. No appointment necessary. More on the library, including directions, here. Fancy a peek at drunk people cavorting within our recently launched Great Coney Island Spectacularium? The video above was shot at our Obscura Day "Oddities" party a few weeks ago. The sharp-eyed among you might spot yourself, the cast of TV's "Oddities" and their spouses, friends, and my mother. You can find out more about the Spectacularium in these recent articles from Time Out New York, New York Press, Boing Boing and Brooklyn Based. Or, of course, on the Spectacularium website, which can be accessed here. Thanks, G. F. Newland, for alerting me to the existence of this troubling video. What, exactly, is it that motivates the collector? Is it primarily an obsession, an addiction or a compulsion? Is the urge to collect benign or malignantly invasive? No one has yet provided a compelling answer, and any collector would be hard-pressed to articulate what exactly is driving the need to hunt down and acquire that next essential piece. The symptoms of the collecting impulse are as varied as the collectors themselves: some collect categorically, some collect socially, and some are driven by aesthetic considerations above all, but most collectors agree that the thrill of that next find is one of life's greatest pleasures, and the love of certain objects can last a lifetime. --Evan Michelson, Collector, Morbid Anatomy Library Scholar in Residence, Star of TV's "Oddities"
I am very pleased to announce "Out of the Cabinet: Tales of Strange Objects and the People Who Love Them," a new collector "show and tell" and lecture series taking place at Observatory and organized as a collaboration between Morbid Anatomy and Evan Michelson, our Library Scholar in Residence and, more recently, star of TV's "Oddities." 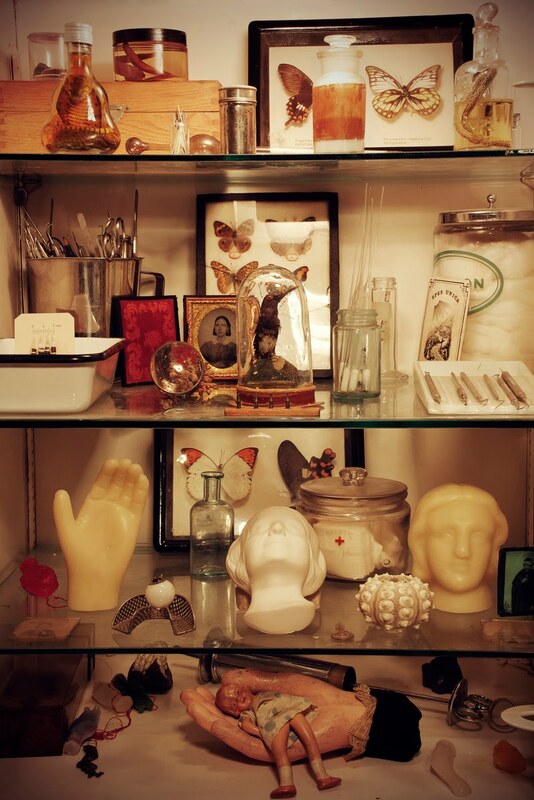 "Out of the Cabinet" will take artifacts as a launching off point for exploring the non-rational power of objects and the alluring mysteries of collecting. For the duration of the series, a variety of collectors will be invited to bring in an object or objects from their own collections and use these artifacts as a departure point for a response of some sort, from an illustrated historical lecture to a loose meditation to a debate with another collector. A few events have already been scheduled (see below), but we continue to seek private or institutional collectors living in--or with plans to visit--the New York City area. 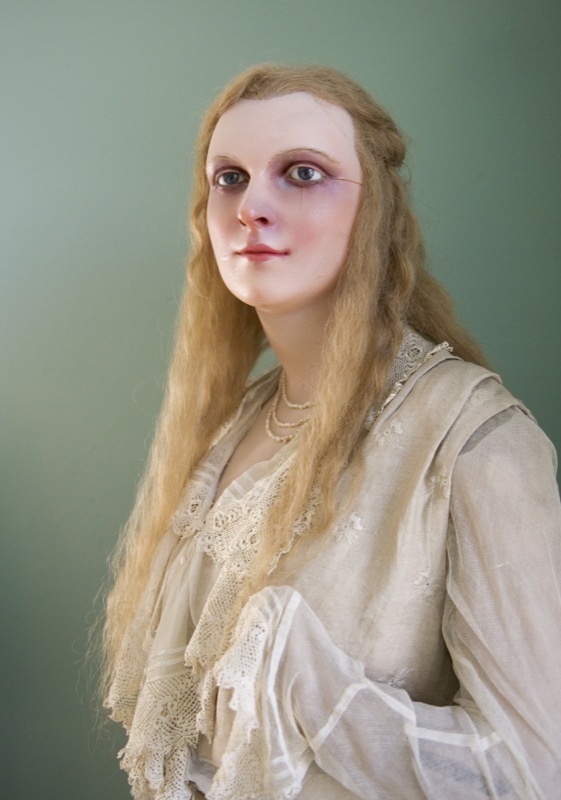 If interested, please email me at morbidanatomy [at] gmail.com; And please, feel free to send this post along to any other interesting collector types you may know. Full details follow. Looking forward to hearing from all you collectors out there! What, exactly, is it that motivates the collector? Is it primarily an obsession, an addiction or a compulsion? Is the urge to collect benign or malignantly invasive? No one has yet provided a compelling answer, and any collector would be hard-pressed to articulate what exactly is driving the need to hunt down and acquire that next essential piece. The symptoms of the collecting impulse are as varied as the collectors themselves: some collect categorically, some collect socially, and some are driven by aesthetic considerations above all, but most collectors agree that the thrill of that next find is one of life's greatest pleasures, and the love of certain objects can last a lifetime. Above all, it is our own personal history that imbues an object with meaning, and gives it resonance beyond its intended life. Collectors tell their inner stories through their acquisitions, and we can suss a collector's personality through his or her items without a word being spoken; a collection is a physical manifestation of the perpetually unseen, inner life. 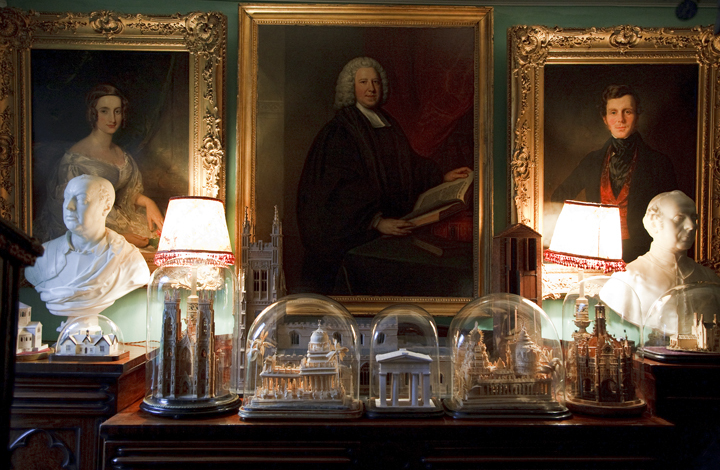 Whether it's the pursuit of beauty, a sense of stewardship, the creation of a personal narrative, a love of science and history or acquisitiveness run amok, the objects a collector lives with speak to an undeniable drive to possess something rare, beautiful or personally significant. In this series, collectors will present some choice objects from their collections and discuss what it means to be possessed by a possession, what layers of meaning an object can hold beyond price or rarity, and what shadowed corners of the psyche are illuminated by the things that hold us in their spell. For more on this series, click here. To keep abreast of newly announced events as part of this series, sign up for the Observatory mailing list by clicking here, or join us our Facebook group by clicking here. For more about Observatory, click here. To contact organizers with questions or suggestions, click here. 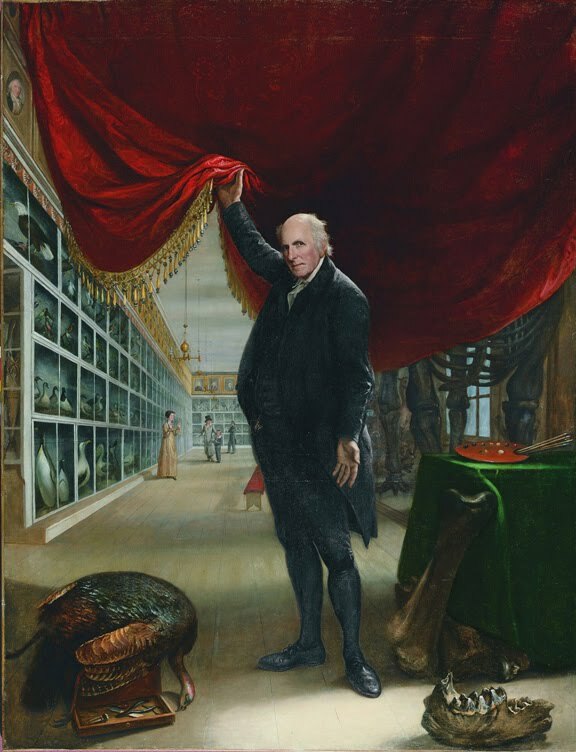 The Artist in His Museum, Charles Willson Peale, Pennsylvania Academy of the Fine Arts, Philadelphia; found here. If anyone has plans to be in the Philadelphia area this week, you might consider popping over to the 2011 Annual American Association for the History of Medicine (AAHM) Meeting, taking place this week at the Philadelphia Society Hill Sheraton Hotel from April 28-May 1, 2011. There are about a dozen interesting looking panels, but the two panels that look the most unmissable to me are the following, both taking place on Friday April 29th: "Museum Practice and the Making of Medical Science: Specimen Collections, Networks, and Institutions in the Late 19th and Early 20th Centuries," which will include two of my favorite scholars, Eva Ahren and Lisa O'Sullivan; and "Digital Media and New Audiences for the History of Medicine," where I will be delivering a short paper, along with such esteemed luminaries as Michael Sappol and Lisa Rosner. Details for these two panels follow; to view the full schedule, click here. Very much hope to see you there! Click here to download a PDF program containing the complete and very extensive schedule. More information about the conference can be found here. Image source: Rhizome.org; no citation found. Click on image to see larger, more detailed version. Le Cochon Danseur (Dancing Pig), 1907, described by IMDB thusly: "A pig dressed in fancy clothes flirts with a pretty girl, but she humiliates him and tears off his suit; she then makes him dance for her affections." Thanks to esteemed Congress of Curious Peoples participant Simon Werrett for introducing me to this fascinating piece of cinematic history with a decidedly early Coney Island bent! From the DVD Saved From The Flames - 54 Rare and Restored Films 1896 - 1944; more on that here. Shikar, or big game hunting, was an immensely popular pastime for the ruling class in India prior to British rule. When the British came into power, elaborate hunting ceremonies were used by Indians and British alike to display their prowess and status to each other. The British influence also brought improvements in hunting technology, which spurred an increase in the capture of game. 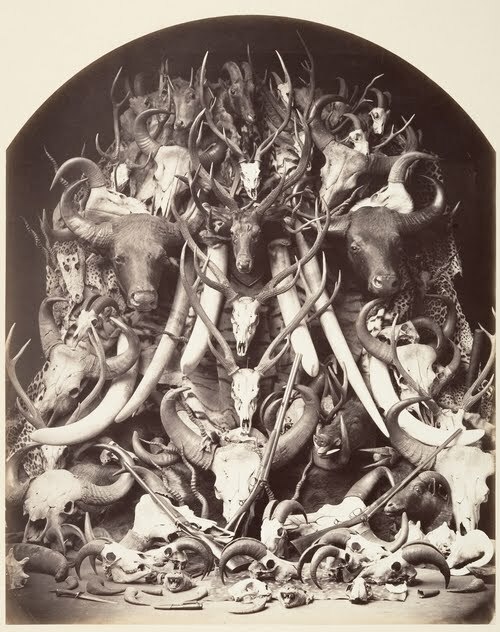 Dozens of animals were killed in a single day's hunt and the trophies decorated the halls of the princes' extravagant hunting lodges. By the late 1870s, the population of many of these rare species had been severely depleted and a government-implemented system for conservation had begun to take hold. From The Metropolitan Museum of Art website. 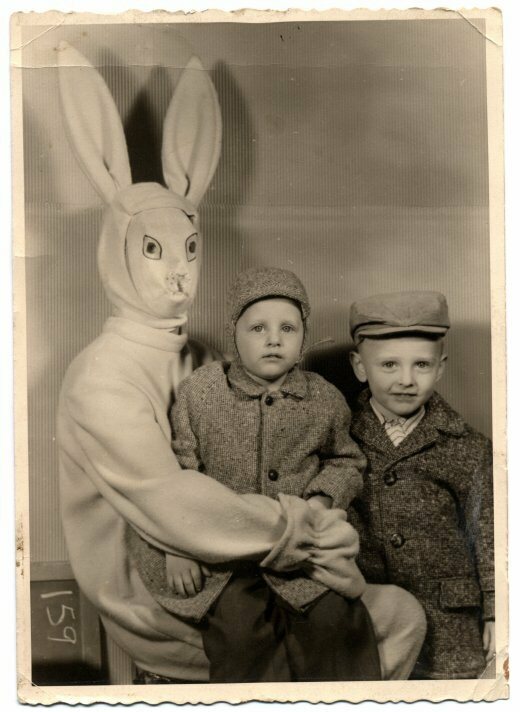 Found via Wunderkammer blog. Click in image to see much larger, more detailed version. Via the Twisted Vintage blog. Thanks, Megan, for inadvertently bringing it into my life! ...In the 1840s there was a steady flow of foreign tourists and pilgrims to the idyllic valleys of [South Tyrol] ... solely to visit two women who were said to have received spontaneously bleeding wounds (stigmata) on their hands, feet, or head like those caused to Jesus Christ when he was nailed to the cross and forced to wear the crown of thorns. One of the two women was Maria Domenica Lazzari (sometimes spelled Lazzeri), and the other was Maria von Moehrl (also called Mörl). 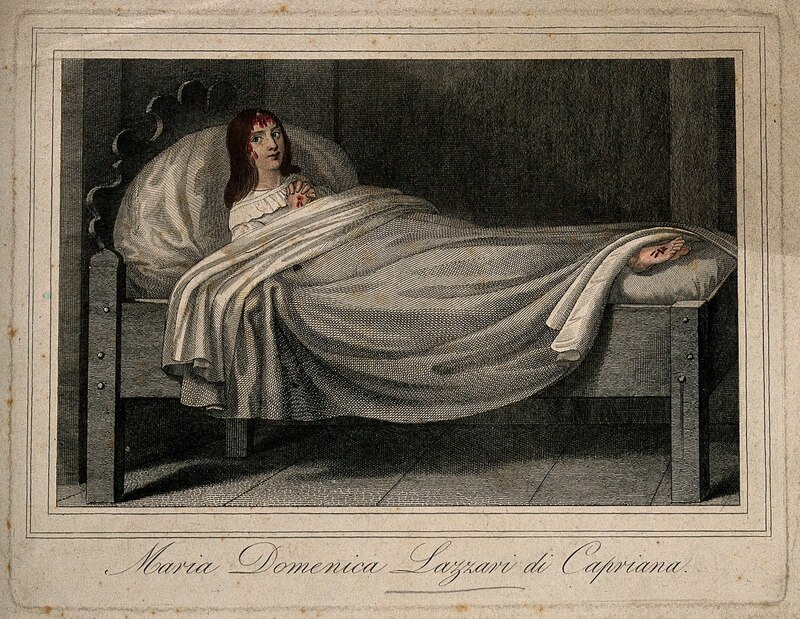 The former was known as L'Addolorata (the woman of pain), the latter as L'Estatica (the woman of ecstasy), for reasons which will become clear. On this Good Friday -- the holiday commemorating Jesus Christ's death by crucification -- why not take a moment to consider the medio-religious condition of stigmata, ie. spontaneous bleeding (mostly found in the female persuasion) on the hands, feet, and/or head, mimicking the wounds caused to Jesus Christ when he was nailed to the cross and forced to wear the crown of thorns? All of the above text and images are drawn from two recent fascinating posts on the Wellcome Library blog; To read the full articles, click here and here. Tonight and Tomorrow at Observatory: Extreme Taxidermy and Dubiously Sourced Bodies and Anatomical Learning! Tonight and tomorrow night at Observatory; hope to see you there! 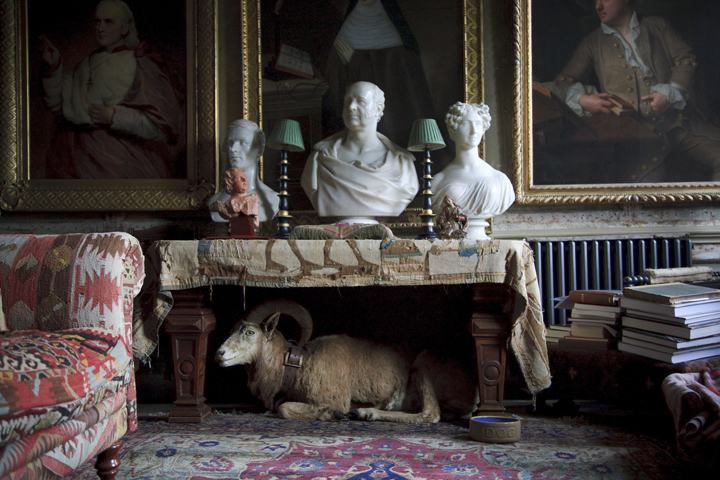 Tonight, taxidermy scholar and collector Pat Morris will discuss the fascinating and sometimes bizarre history of taxidermy as explored in his new book A History of Taxidermy: Art, Science and Bad Taste. 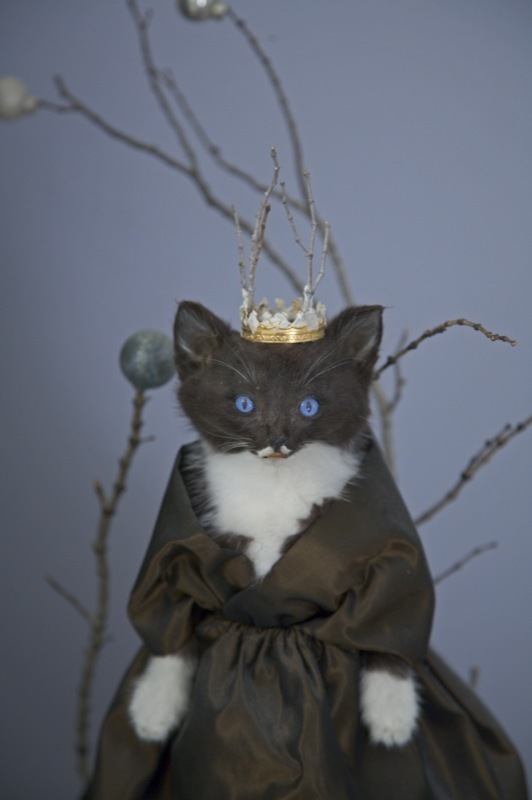 Along the way, Morris will discuss anthropomorphic taxidermy of the sort made famous by Victorian museologist and taxidermist Walter Potter, "extreme taxidermy" (ie. human taxidermy), and the role of taxidermy in the history of scientific display and popular culture. He will also detail the development of taxidermy as an art form, tracing its development from the stiff rudimentary mounts which characterized its beginnings to the artistic triumphs of the late 19th and early 20th Centuries. Copies of his new book History of Taxidermy: Art, Science and Bad Taste will also be available for sale and signing. Dr. Pat Morris is a retired staff member of Royal Holloway College (University of London), where he taught biology undergraduates and supervised research on mammal ecology. In that capacity he has published many books and scientific papers and featured regularly in radio and TV broadcasts. The history of taxidermy has been a lifelong hobby interest and he has published academic papers and several books on the subject. With his wife Mary he has travelled widely, including most of Europe and the USA, seeking interesting taxidermy specimens and stories. 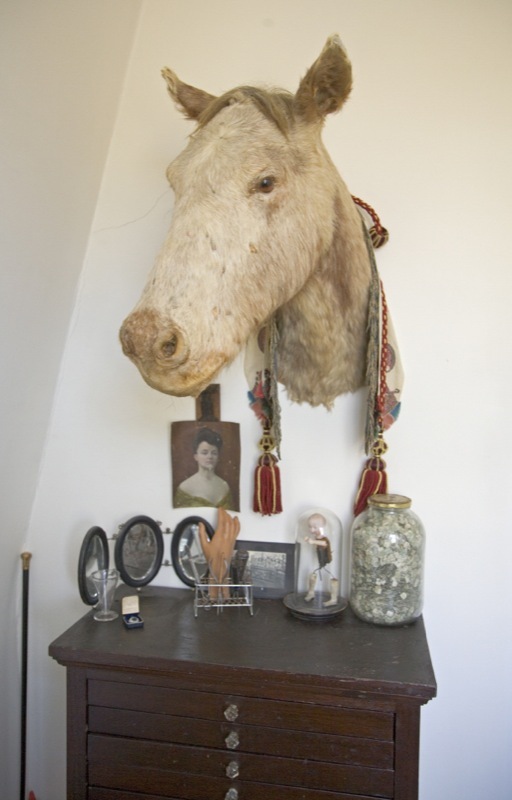 They live in England where their house is home to the largest collection and archive of historical taxidermy in Britain. The idea of donating your body to science is actually a very new concept. There wasn’t even a national law governing the process until the late 1960s. How, then, did medical illustrators, going back hundreds of years, acquire bodies to draw? Many bodies were “donated” alright, but the dead people didn’t know they were being so generous. Prisoners, the indigent, robbed graves, and even murders helped supply medical schools and doctors for centuries. This wild history of sourcing human bodies spans from the dawn of modern anatomy in the Renaissance with Vesalius (and even artists like Da Vinci and Michelangelo), through the 19th century's institutionalized medical school body snatchings, and up to Nazi medicine and the controversy over plastinated bodies in exhibits like Body Worlds. 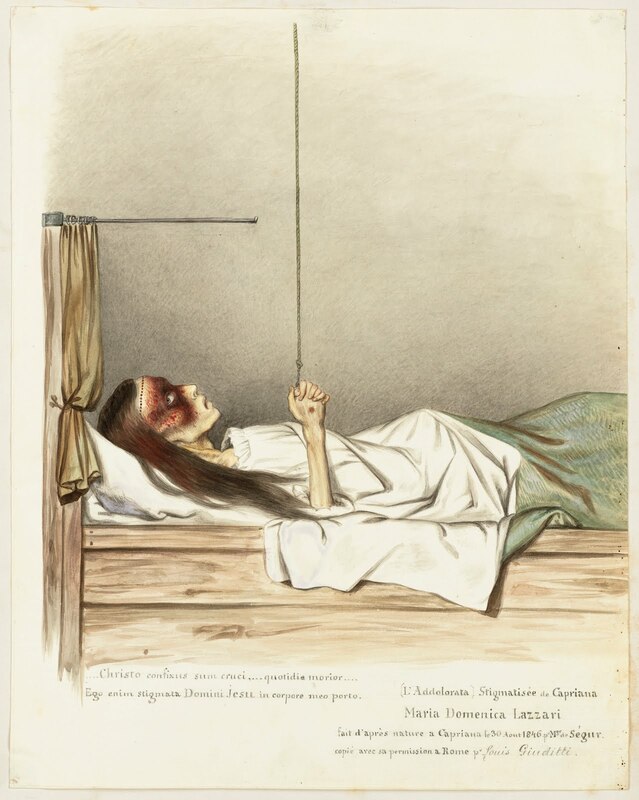 For tonight's lecture, join Megan Curran of USC's Norris Medical Library for fascinating accounts of how bodies were procured for the advance of science, often through less than ethical means, accompanied by images from USC's rare medical books. Megan Curran is the Head of Metadata & Content Management for the Norris Medical Library of the University of Southern California in Los Angeles, CA. Megan manages the history of medicine and rare books collections at USC and has been working to promote that collection. Megan serves on the editorial board of the Journal of the Medical Library Association, and is on the board of the Archivists & Librarians in the History of the Health Sciences. Megan originally hails from Philadelphia and is a dyed-in-the-wool rare book nerd. You can find out more about these events on the Observatory website by clicking here and here; You can get directions to Observatory--which is next door to the Morbid Anatomy Library (more on that here)--by clicking here. You can find out more about Observatory here, join our mailing list by clicking here, and join us on Facebook by clicking here. Images: Top: The Auto-Icon of Jeremy Bentham. Mr. Bentham requested in his will that his body be preserved and stored in a wooden cabinet. It has been on display since 1850 at University College London. Photo by Joanna Ebenstein. Death Masks From the Halle Collection, Early 20th Century? 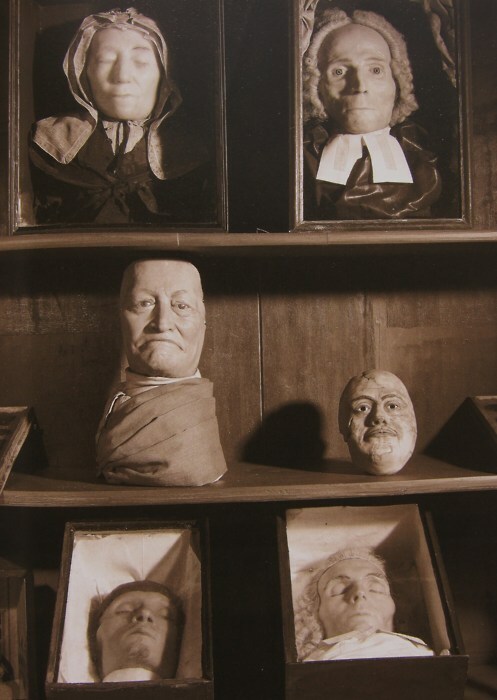 This image is cited as "Death Masks From the Halle Collection" but I could find no verification of this. Nevertheless, fantastic image. Automata were... theologically and culturally familiar, things with which one could be on easy terms. They were funny, sometimes bawdy, and they were everywhere... Mechanical devils were...rife. Poised in sacristies, they made horrible faces, howled and stuck out their tongues to instill fear in the hearts of sinners. The Satan-machines rolled their eyes and flailed their arms and wings; some even had moveable horns and crowns. A muscular, crank-operated devil with sharply pointed ears and wild eyes remains in residence at the Castello Sforzesco in Milan. I highly encourage you to read this fascinating article in its entirety; you can do so by clicking here. 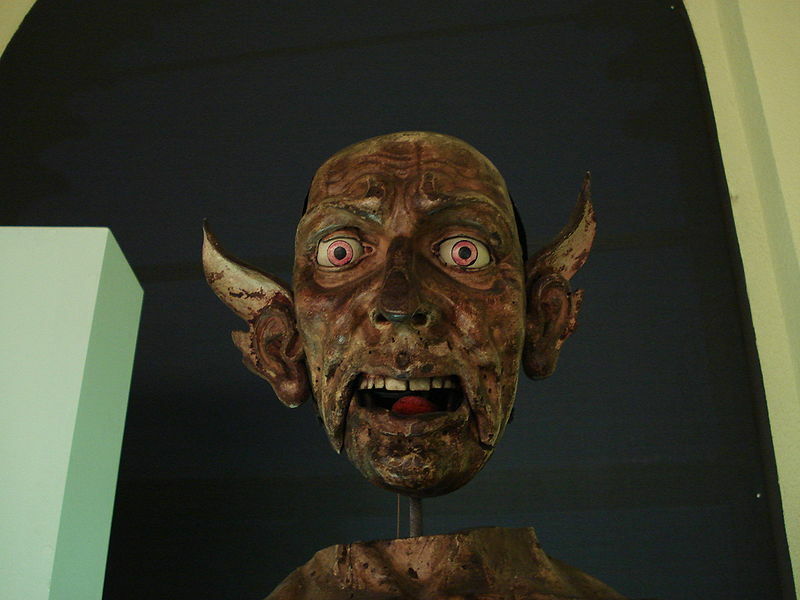 Images: Italian Automaton (The Devil), carved in wood, 15th and 16th centuries, from the Wunderkammer owned by Ludovico Settala. It could, in the words of the Cosmodromium Blog, "roll its eyes and move its tongue, emit a noise and spit smoke from the mouth." Images sourced here. All images and ideas sourced from the Cosmodromium Blog; read whole post--and see additional images--by clicking here. This Weekend: The Amazing, Incredible, Thrilling Congress For Curious People 2-Day Symposium! This Saturday and Sunday, why not make the trip out to Coney Island to take in some lectures and spirited discussions on the topics of the questionable delights of immersive amusements, human anatomy on display from fairground to museum, science for public amusement, dime museums and their place in the 21st Century imagination, and scholarship as artistic medium, featuring a variety of inspiring scholars, collectors, authors, artists and practitioners, and all housed provocatively within the immersive amusement that is the Great Coney Island Spectacularium? 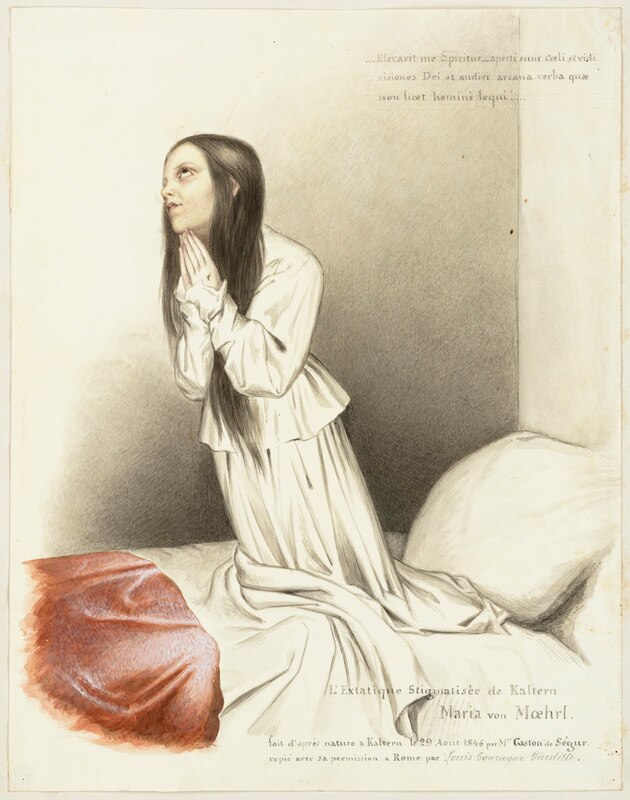 The event--called the Congress for Curious Peoples and co-curated by The Morbid Anatomy Library --features many of my favorite scholars, artists, collectors and bon vivants, including (but not limited to!) Mark Dion, Norman Klein, Mark Dery, Lord Whimsy, John Troyer, Evan Michelson, Mike Zohn, and Laurel Braitman; I will also be on hand to present a brief paper and take part in a discussion, and, of course, there will be a scheduled break to take in the Super Freak Weekend Freakshow downstairs at Coney Island USA. This is going to be a seriously unmissable weekend. Full schedule and line-up for the Congress for Curious Peoples follows. Can't wait, and hope very much to see you there! Norman Klein, author of "The Vatican to Vegas: The History of Special Effects"
Wendy Walker, author of "The Secret Service"
Mark Dery, author "The Pyrotechnic Insanitarium: American Culture on the Brink"
Amy Herzog, author of "Dreams of Difference, Songs of the Same: The Musical Moment in Film"
Moderated and Introduced by Alison Griffiths, author of "Shivers Down Your Spine: Cinemas, Museums, and the Immersive View"
Lisa Farrington, author of "Creating Their Own image: the History of African-American Women Artists"
Anna Maerker, author of "Model Experts: Wax Anatomies and Enlightenment in Florence and Vienna, 1775-1815"
Elizabeth Stephens, "Anatomy as Spectacle: Public Exhibitions of the Body from 1700 to the Present"
Will Baker, author of "Multiple Meanings and Values in Johnny Fox's Freakatorium"
D. B. Denholtz, editor of "Shocked and Amazed: On & Off the Midway"
Evan Michelson, Obscura Antiques and star of TV's "Oddities"
Mike Zohn, Obscura Antiques and star of TV's "Oddities"
Moderated and introduced by Andrea Dennett, author of "Weird and Wonderful: The Dime Museum in America"
Fred Nadis, author of "Wonder Shows: Performing Science, Magic, and Religion in America"
Simon Werrett, author of "Fireworks: Pyrotechnic Arts and Sciences in European History"
Moderated by Lord Whimsy/Allen Crawford, author of "The Affected Provincial's Companion, Volume One"
Tickets for the weekend are $25 and can be purchased by clicking here. To find out more about The Congress for Curious Peoples, click here. To find out more about The Spectacularium, click here and to read some recent reviews of The Spectacularium, click here and here. Special thanks to the Andy Warhol Foundation, whose generosity helped to fund all of these fantastic events. Also, the lovely poster was designed by the incomparable Lord Whimsy; click on image to see larger more readable version. Tonight at The Coney Island Museum: Acep Hale on Con Men and Sideshow Legends Ward Hall and Bobby Reynolds! 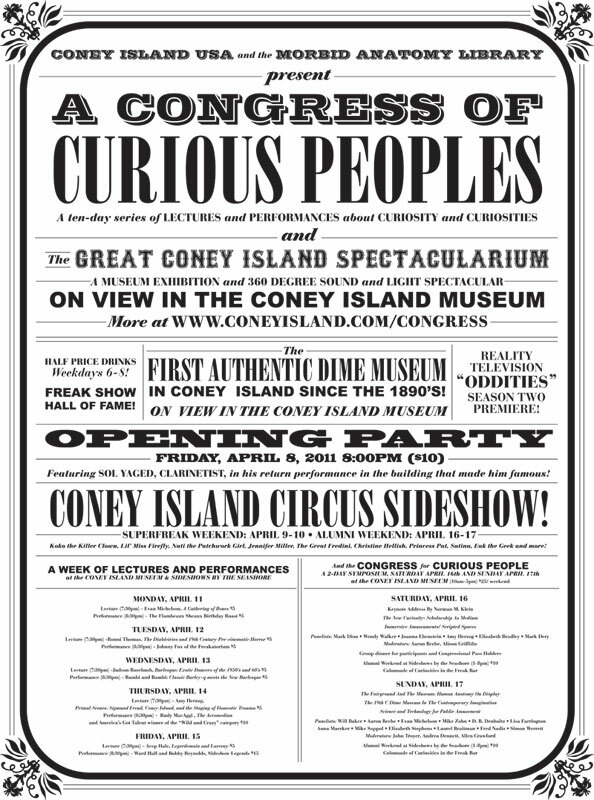 Tonight, as night 7 of the Congress of Curious Peoples, we have a fantastic double header: magician and scholar Acep Hale lecturing on ""Legerdemain and Larceny'--a history of the con man--followed by a performance by sideshow talker legends Ward Hall and Bobby Reynolds onstage for the first time ever in Coney Island. This is sure to be an incredible night! Full details follow; very much hope to see you there. Acep Hale, "Legerdemain and Larceny"
Coney Island, like most fairs, amusement parks, and midways has always had a reputation for hucksterism and the con job. Join magician and scholar, Acep Hale, as he explores the history of the con, taking the audience on a guided tour of the clowns, contrarians, murmurers and mystics that have held fast to lives of wandering wonder throughout the ages. 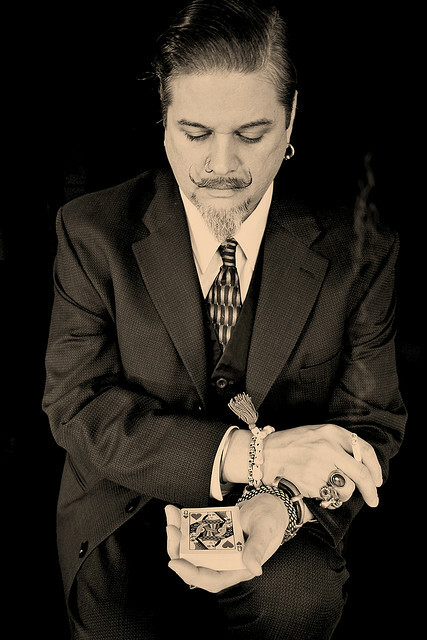 Acep Hale is a street performing magician, musician, traveler, and rogue gentleman scholar. Driven by the 19th century belief in propaganda by deed he performs daily on street corners everywhere to prove that magic still lives around every bend, you don’t need a nine to five to stay alive, and hope springs eternal between the cracks of every sidewalk.”. Ward Hall (born 1930) has been around longer than anyone in the business and runs The World of Wonders Sideshow. He is "a modern-day P.T. Barnum and the last of the sideshow promoters. He's a national treasure who is loved and revered by showfolk, sideshow historians, and fans the world over." Bobby Reynolds (born 1932) got his start at Hubert's Museum in Times Square and has been talking, performing in, and operating sideshows ...ever since. He still comes out of "retirement" every year or so to run shows all over the world. "With his two-headed babies, all frog band, and giant rat, Bobby has perfected the art of giving people the art of giving people what they didn't know they wanted." For more info--and to purchase tickets--click here and here. Tonight: Morbid Anatomy Scholar in Residence (and Star of TV's Oddities ) Evan Michelson on The Late Late Show with Craig Ferguson! If you missed Morbid Anatomy Library scholar in residence (and star of TV's "Oddities") Evan Michelson's lecture "A Gathering of Bones" the night before last as part of The Congress of Curious Peoples, you might want to tune into the Late Late Show tonight at 12:35 AM to watch her match wits with Mr. Craig Ferguson! I know I will be doing so. Image: An early 20th Century department store mannequin from the collection of Evan Michelson, as seen in the Secret Museum project. Tomorrow Night: Ronni Thomas on Diableries AND Johnny Fox of the Freakatorium! Coney Island Double Feature! 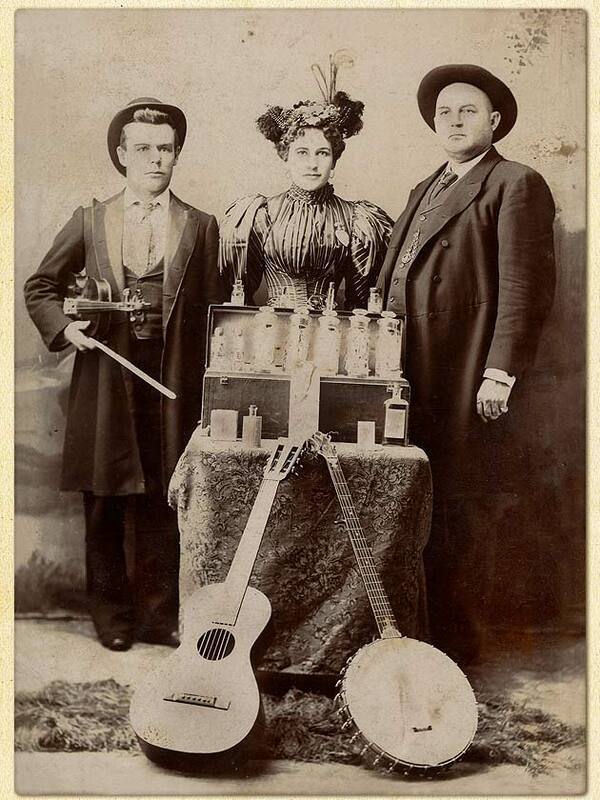 Tomorrow night's double feature, featuring Ronni Thomas on Diableries and Johnny Fox of The Freakatium, will surely be amazing; full line-up of the 10-day Congress of Curious Peoples can be found here; hope to see you there! 3D is very much in the news these days, and while Hollywood has finally come close to perfecting this technology for the silver screen, people are largely unaware that the Victorians were also aficionados of 3D technologies, and that this interest often took a turn towards the macabre. 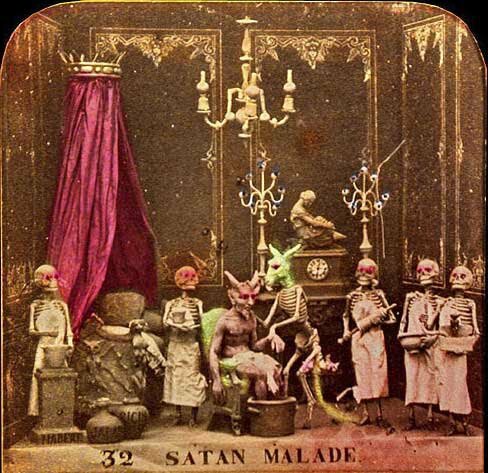 Tonight, filmmaker and collector Ronni Thomas will lecture on the history of 3D spectacles of the Victorian age, especially the infamous Diableries series–masterfully designed 3D stereo ’tissues’ created in france in the 19th century, backlit and featuring ornate scenes depicting the daily life of Satan in Hell (see image to left for example).Tongue in cheek and often controversial, these macabre spectacles give us a very interesting look at the 19th century’s lighthearted obsession with death and the macabre, serving as a wonderful demonstration of the Victorian fascination with themes such as the afterlife, heaven, hell and death. In addition to the lecture, Thomas will display original Diableries and other artifacts from his own collection. Guests are encouraged to bring their own pieces and, better yet, a stereo-viewer. Magician, raconteur, and sword swallower extraordinaire will regale with tales of his long-gone Freakatorium and amaze the audience with wondrous feats of daring. To see a full lineup of the Congress of Curious Peoples, click here. Tomorrow night, why not consider joining me and Morbid Anatomy scholar in residence (and star of TV's "Oddities") Evan Michelson at Coney Island for her new lecture "A Gathering of Bones?" If her former lectures are any indication, this is sure to be a great one! The event--which will take place within the newly opened Great Coney Island Spectacularium!--begins at 7:30. Drinks are half price at the bar until 8:00. Hope very very much to see you there! Human bone: one of the most common materials on the planet. And yet, at one time the remains of certain individuals were prized more highly than the rarest, most precious metals and gems. The cult of the saints, the backbone of the early Christian Church, gave rise to an institutional fetishization of human remains that produced objects still unsurpassed in craftsmanship and opulence. The aesthetic of the most humble and commo...n organic remains coupled with gold, silver, gems and textiles has for centuries proved irresistible to secular collectors and religious institutions alike. The ultimate collectible, the constituent parts of each and every human on the planet were once the object of obsession, veneration and murderous desire. As a collector myself, Christian relics provided my earliest exposure to the realm of transcendently beautiful, perverse and venerated objects. The collection and categorization of human remains underwent a drastic change with the enlightenment, but the unquenchable human thirst for knowledge and comfort in the face of our own mortality has ensured that the corpus remains at the center of an unending human fascination with and confrontation of the greatest mystery of all. The gathering of bones continues to this day, still controversial, decadent and utterly essential to the human narrative. This event is part of The Morbid Anatomy Library Collector Series. This event is made possible, in part, by a grant from the Andy Warhol Foundation. 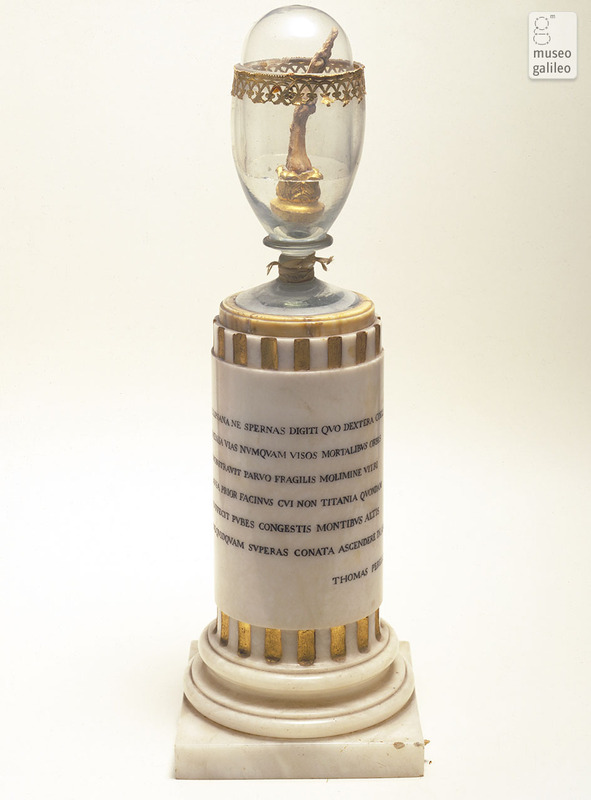 Image: Galileo's finger mounted on a marble base and encased in a crystal jar, as on view at the Museum of History and Science in Florence, Italy. More on that--and image source--here. Click on image to see much larger, more detailed version.